I don't know if it's happening where you are, but in Alaska, fall is here in full force. The change of seasons has left me wanting warm things like soups and stews, but not the same old stuff I've been making forever. So, I decided to put a twist on an old favorite. Turmeric has amazing anti-inflammatory properties, and the nutrients from bone broth are amazing for your gut health. 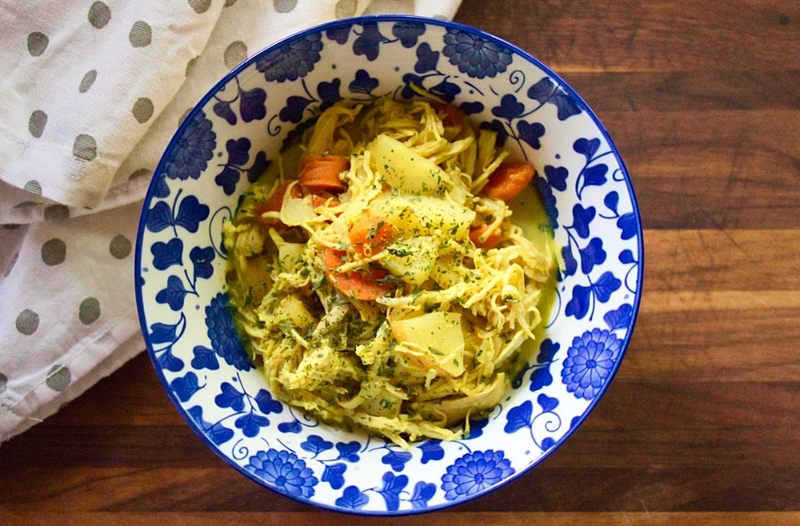 So, not only does this stew taste amazing, but it's also good for your body! Melt coconut oil in a large pot over medium-high heat. Add onion and saute until beginning to brown, about 6 minutes. While the onion is cooking, add the coconut milk, turmeric, cumin, coriander, and ginger into a blender and blend well. Once the onions have begun to brown, add the carrots and parsnips to the pot. Cook until they begin to soften, about 5 minutes. Add the turmeric and coconut milk mixture, chicken, apple cider vinegar, and broth to the pot. Season to taste with salt and pepper. Bring to a boil, then reduce the heat to low and simmer until the vegetables are cooked and the stew has thickened slightly. Serve alone or over cauliflower rice. You can use leftover chicken, or cook 2-3 chicken breasts in the crockpot or InstantPot. You can use the liquid from cooking as part of your broth. If you cannot find parsnips, substitute yellow or red potatoes. This could also be made entirely in the Crockpot or InstantPot. Simply add all the ingredients to the insert and cook on low for 6-8 hours or high pressure for 45-60 minutes. Shred the chicken and let simmer for a few minutes with the lid off once cooking time has elapsed.